Xtend-Life has been providing quality natural skin care products since 1998, and during the past decade has grown into a massively successful company that has helped thousands of people regain the youthful appearance of their skin. The Xtendlife Age Defying Hydrating Mask is specifically designed to work in conjunction with Xtend-Life facial creams to provide a hydrating boost periodically. Even individuals that have perfect skin can benefit from using this product, as it will not only rejuvenate and replenish, but it also prevents the aging process by maintaining optimal moisture levels. Unlike other facial masks, the Deep Active Hydrating Mask is completely transparent, so you won’t have to hide in your house with an embarrassing blue or green face for half an hour. In fact, after 30 minutes the product will have been completely absorbed into your skin, and you will be able to see and feel a noticeable difference in the softness and shine. How Does the Age Defying Hydrating Mask Work? The Age Defying Hydrating Mask works by using a proprietary blend of vitamins and plant-based antioxidants, essential lipids and fatty acids, and powerful plant oils. Together, these ingredients work in synergy to provide the necessary boost your skin needs to rejuvenate and replenish essential oils. Simply rub the facemask into the skin thoroughly about 30 to 60 minutes before going to bed, and wake up with fully hydrated and healthy skin. The Hydrating Mask is so powerful it only needs to be used once every two weeks to maintain adequate moisture levels. For optimal results it is recommended to use the Xtend-Life cleansing mask once every two weeks on an alternating basis with the hydrating mask. In other words, on week one you would apply the hydrating mask, on week two the cleansing mask, on week three the hydrating mask, and so on. What Are the Main Ingredients in the xtend-life Age Defying Hydrating Mask? 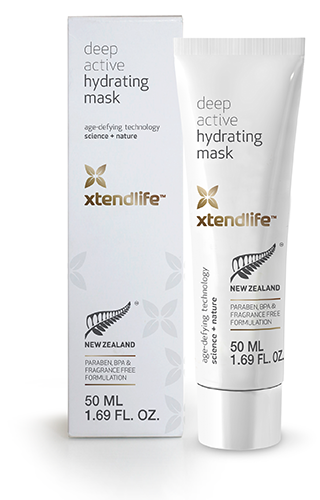 There are eight main active ingredients in the Xtendlife Age Defying Hydrating Mask – Active Manuka Honey, Allantoin, Avocado Oil, Natural Vitamin E, Cetiol CC/ Cegasoft PFO/Ceftiol PLG(natural emollients), Macadamia Oil, Rigin, and Xtend-TK. Xtend-TK is an ingredient that is found in all of Xtend-Life’s products, which contains bioactive keratin that is known to heavily stimulate skin cell growth and regeneration. Avocado oil has been proven in clinical studies to moisturize the skin with healthy omega-3 and omega-9 oils. Rigin is a complex peptide that has been shown to make the skin smoother and firmer by producing cytokine secretion. Since cytokines are some of the main contributors to the skin aging process, Rigin is one of the most important ingredients found in the Age Defying Hydrating Mask. Can the Age Defying Hydrating Mask Be Used for All Skin Types? Fortunately, all of Xtend-Life’s skin care products can be used on any skin type, and most have even been shown to improve irritating skin conditions like rosacea. While people with such conditions would not be able to use most other skin care products because they contain artificial chemical fragrances, Xtend-Life does not use any additional fragrances, so there are no overbearing smells, allergic reactions, or irritating side effects. All of the ingredients in the Deep Active Hydrating Mask can be found and extracted easily from nature, unlike other skin care products, which contain synthetic compounds that can react differently in each individual. Because Xtend-Life products simply enhance the human body’s ability to function optimally in relation to skin regeneration, it is much more effective than artificial skin care products that rely on unproven and possibly harmful ingredient delivery and activation techniques. Try Xtend-life Age Defying Hydrating Mask today for younger, firmer skin in no time – naturally.